We’re proud to announce the arrival of the next major version 1.1.1 of LinkedData.Center service which is now available to all our customers. With this milestone we introduce new great features since version 1.0 as well as some clean-up and bug fixing (see change log). LinkedData.Center ingestion APIs now fully supports latest specification of KEES (Knowledge Exchange Engine Schema). This allows to reuse and share knowledge base configurations on the web. Now many LinkedData.Center APIs support HTML rendering through http content negotiation, allowing to call LinkedData.Center features from a standard web browser. A simple control panel is available. 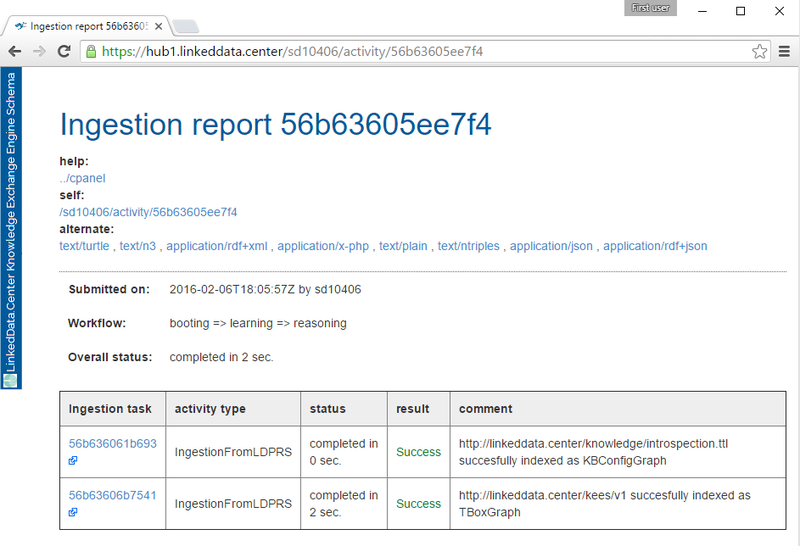 You can get a full report for an ingestion activity both in RDF and HTML. We also improved the dataset automatic collection of provenance metadata. ...embedded Questions & Answers engine, Linked Data Platform paging protocol support, smart ingestion form SPARQL endpoints and many more. Exploit the potential of the new ingestion engine.